Here we go; some of the updates you might be interested in if you're planning on going to Courage to Stand Intl. 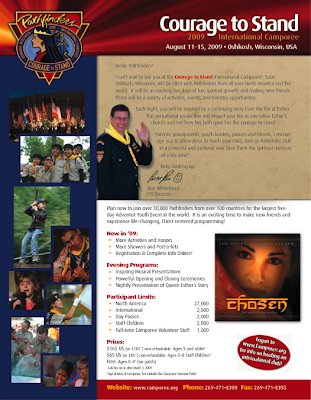 Pathfinder Camporee this next month. More updates at the Center for Youth Evangelism's newsletter. Watch for a surprise announcement on the final night of the camporee about the next international camporee in 2014. The announcement will be after the final Esther story presentation and the pastor's message, according to the newsletter. Also, there will be 4 Pathfinder mission trips offered in 2010 to Africa, India, Brazil and Belize. So be sure to watch for more information at the Camporee. Get the camporee theme song, "Courage to Stand," for free on iTunes. Click here. Cancelled: This year's BMX and mountain biking activity. 3-on-3 Basketball Tournament: There are only 100 slots available, so be sure to register soon! More info. There's a good chance you'll find a cool honor to earn during the camporee, considering that there will be 121 different honors taught this year. Check out the list. If you or someone you know wants to get baptised at the camporee (A Sabbath Blog recommends it), click here. Hope Channel will be broadcasting the nightly programs live on TV as well as streaming the service on the web.